It's release week for both RUSH by Eve Silver and ANOTHER LITTLE PIECE by Kate Karyus Quinn! It's SMACKDOWN TIME! What is the SMACKDOWN all about? 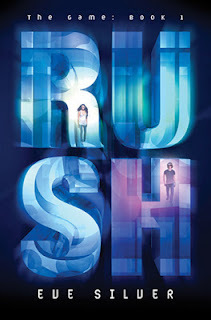 Kate Karyus Quinn's ANOTHER LITTLE PIECE and Eve Silver's RUSH are release-date mates, June 11, 2013. When Kate and Eve realized their books come out on the same day, they decided to give a shout out to each other's titles. They discussed options including guest blogs, contests, tweets, status updates, and then things turned dark. Very, very dark. History will never know for sure who threw down first, but Kate and Eve's Smacktalk ramped up with each email exchanged, until The Smackdown was born (in blood and fire and pain...well, not really, but you get the picture). Each day from June 10-14, there will be video/gif challenges posted on the following blogs listed below. Commenters vote for their winner. All comments are entered to WIN one of two awesome prize packs. Each day, there will be excerpts and more posted on the same blogs. Commenters are entered to WIN one of two awesome prize packs. Make sure to stop by Once Upon A Twilight tomorrow for round 4! So... Song or Dance? Who won this round? Kate Karyus Quinn has two college degrees - a BFA in Theatre from Niagara University and an MFA in Film and Television Production from Chapman University. 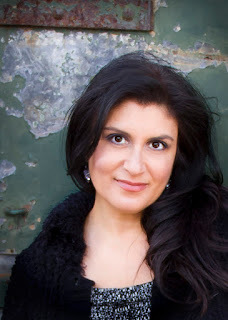 In addition, her short romantic fiction pieces have been published in Woman’s World magazine. After growing up in the suburbs of Buffalo, NY, Kate left her hometown for Southern California and film school. 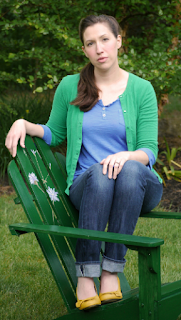 After finishing her degree, she moved with her husband to Knoxville, Tennessee. However, just recently she made the move back home, with her husband and two children in tow. She promised them wonderful people, amazing food, and weather that would... build character. Kate is first and foremost an avid reader and unapologetic booknerd. 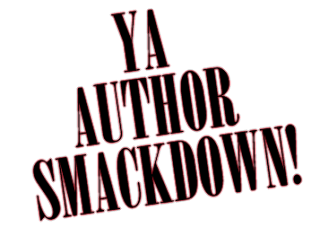 Although, she mostly reads YA and romance, she often samples different genres in her constant search for the next great read. Kate is represented by Alexandra Machinist of Janklow and Nesbit. 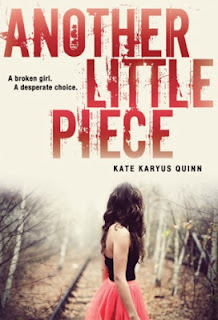 Her book, ANOTHER LITTLE PIECE, will be published by HarperTeen in Summer 2013. Eve cheated! But it was pretty funny. OMG those were awesome!! For one, I loved Kate's rockstar glasses, but the best was when she warmed up in the shower with the shower head as a microphone. I think it's funny that Eve didn't really do the dance. I liked her props though for Round 3 and Modern Dance. Also, dude that guy is buff!!! THIS IS AWESOME!! I loved that Kate sang in the shower :). Love the blogs today!! My favorite part is the rockstar glasses and that Kate had to go into the shower to sing. LOL So funny!!! For that alone, I vote for her because really I think both books sound amazing and I couldn't pick one. This round for effort and the fact I love that song I give this round to Kate. Eve was creative, but hehe would've been nice to see her own dance/song. Kate won hands down for this one! I thought Eve's was hilarious. I also went to a tango class, it was rather disorganized and the teacher didn't spend much time teaching at all, so it felt more like a social dance hour. Though fun with friends was great beyond anything.